What would you like for Christmas little girl? I bet being stuck in this hospital bed, away from your family over Christmas must be scary. All these strange noises and smells. I bet it all gets a bit much for you and you probably have a few nightmares. Well, until NOW! 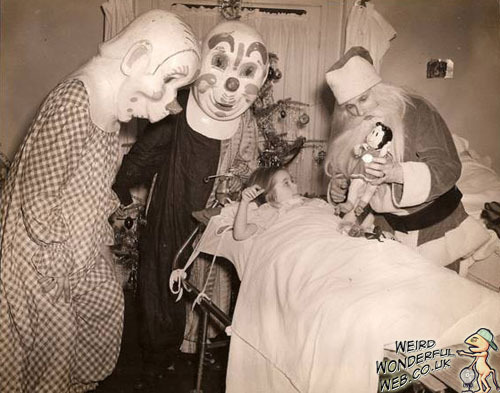 Those silly little 'bad dreams' will seem like nothing compared to the nightmares you're gonna have after this visit! Think about the worst nightmare you've had here so far then add to that the traumatising image of being surrounded by the creepy, fixed-expression faces of a couple of giant-headed clown monsters with booming muffled voices. Oh and FYI before we go, This doll I'll be leaving with you all night is a very old doll and has lived in this hospital for a very long time. You MUST cuddle her close all night! Whatever you do don't just stuff her down the end of the bed. In years gone by, little children have awoken to a sharp scratch at their ankles and found a surgical scalpel in the little dolls grasp. Nobody ever seems able to remove it. No matter how much strength is applied. Dolly usually gets put in a draw after that happens, but mysteriously when you check on her days later, the scalpel is just laying next to her and there is absolutely no evidence as to how the scalpel was attached and doesn't appear as if it ever was. Hhhhhaaaanyway! Merry Christmas little cherub and a very happy new year! Get well soon! Truth be known, that isn't actually a Little Lily doll but a real girl which Santa had shrunken as punishment for her having misbehaved. I'm not at liberty to reveal details but suffice it to say that it was of a carnal activity.